He used to go about once a month to the Percival David Museum of Chinese Art to build up his knowledge of Chinese porcelain. 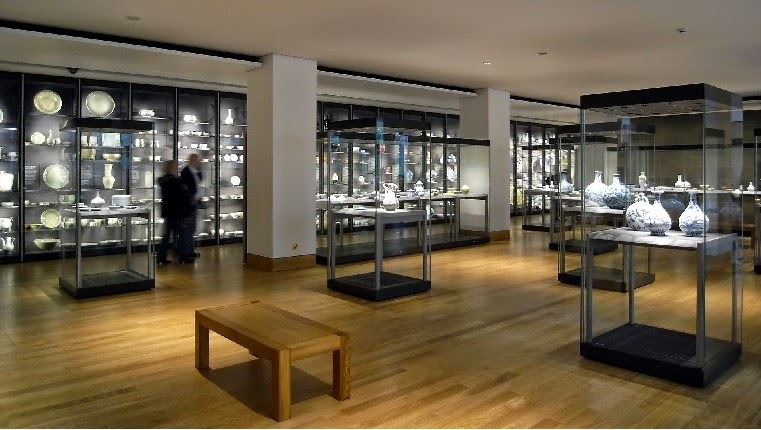 That was before the collection was moved to the British Museum , when it was still in a house in Bloomsbury. On that cold, wet November day he had the place to himself – or so he thought. 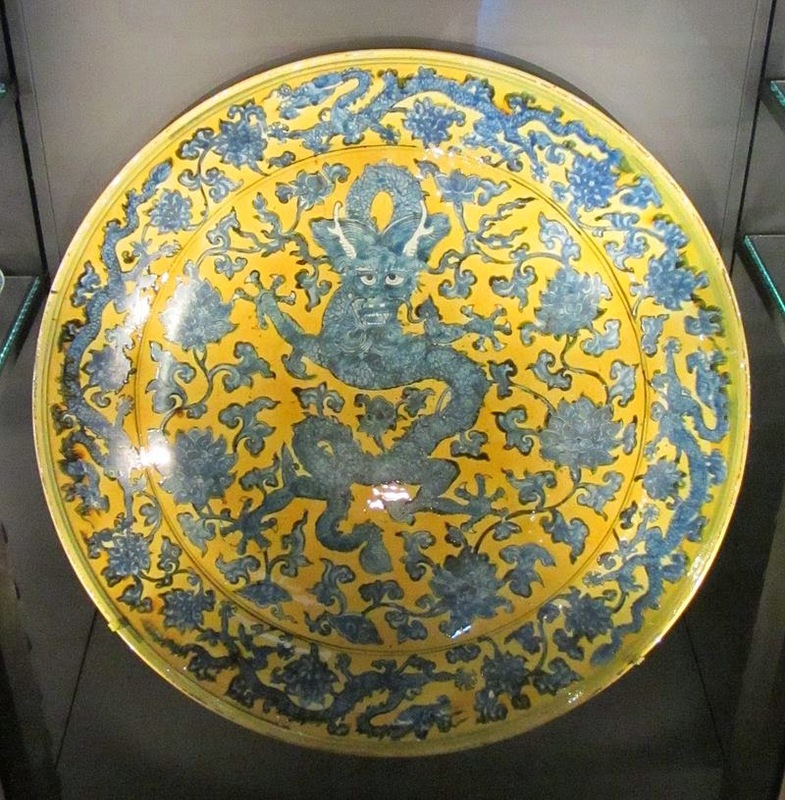 He gazed at pots that were becoming as familiar as the crockery in his kitchen and were infinitely more beautiful: Qing dynasty bowls with delicate designs of peach and cherry blossom and chrysanthemums; Ming plates with brilliant green dragons chasing their tails on a lemon-yellow ground. It was when he turned to look at the Ru ware that he realised he was not alone. There was a woman, wearing a belted raincoat, raindrops glistening on dark hair. She stood before the case transfixed. He didn’t wonder. The pots were perfect: so simple, so plain and undecorated and such a wonderful colour, hard to define – a greyish, greenish blue. As he drew closer, he saw that she was staring at a little bowl. ‘That’s one of my favourite pieces,’ he heard himself say and she gave a little jump. observations: Now, we’re not taking credit for this book at Clothes in Books, but a recent entry on one of Christine Poulson’s earlier books, Footfall, wondered when she would produce something new, and how she could be encouraged to do so asap. Et voila, here is a new book. Well, actually it was already written by then – Poulson came into the comments to tell us. And we promised to feature it, so here we go. All her previous crime stories – three excellent books featuring academic sleuth Cassandra James – have appeared on the blog (Murder is Academic, Stage Fright and Footfall) , but this is a standalone thriller, with an intriguing premise involving a man going into the witness protection programme, and a woman who finds she doesn’t know very much at all about the man she has been meeting regularly and falling in love with. It’s got an excellent, tense plot, shifting between the two main characters, with a good number of surprises along the way, and settings including a cemetery in Sweden and the British Library (libraries are definitely a Poulson interest – see Footfall for more), as well as the china collection above. Poulson always has great, strong women characters, with real lives and feelings. And, although there are some very gruesome goings-on, I liked the fact that the depictions of violence and injury were realistic without being over-detailed or gloating. In far too many modern crime books there are far too many unpleasant descriptions of violence against, particularly, women and children – it was a pleasure to find a book that did the excitement, the jeopardy and the thrills without putting off this reader. I know I'm not the only crime fan to feel like this, and I would be strongly recommending this book on those grounds alone: but it is a very good read for anyone. The book is published by Accent Press, and Christine Poulson has a blog called A Reading Life. My only complaint is: not quite enough clothes descriptions of a kind suitable for the blog. So the pictures are a cheat, but as the book is called Invisible, I thought it was fair enough to have shadowy figures in the correct setting – this is the right china, though in its new home of the British Museum. Both pictures are from Wikimedia commons and used with the permission of the photographer, Babel Stone. Moira - Poulson's work is already on my TBR, so I'm very glad you've nudged me to get to it. Soon. I already like the premise for this one very much, and I can just picture that belted raincoat. I think you'll enjoy them Margot, and I suspect also you will share my joy at finding an author who writes good tense exciting books without too much gruesomeness. Moira, I think with an academic sleuth around, libraries and books can't be far away. I haven't read many books with libraries as one of the elements, but I have read several novels set in and around cemetries, not consciously, of course. They can make a nice, albeit spine-chilling, setting for stories. I used to be a member of the British Library a long time ago. They have now relocated to a suburb that's out of the way for me. Is that in Mumbai, Prashant? (I think that's where you live, forgive me if wrong!) I think I can safely say that I love all libraries - they were so important to me when I was a child, my first love. Great settings in this book - the cemetery scenes are really atmospheric. Yes, Moira, I live in Mumbai. The America Centre Library is very close to my office but I have always preferred the BC Library. I used to read a lot of books, at times three entire novels a day, in my youth when I'd little else to do. I got them from local circulating libraries that are now almost extinct. Three a day is impressive! Even buying a much-wanted book (now that I can afford it) doesn't match the excitement of finding the right book in a library I think. Thank you so much, Moira. I am delighted that you liked it. You're right about libraries: I love them (museums, too). I'll try and get more clothes into the next novel! Interesting, I'll add it to the maybe list, for consideration when I've dented the pile. I like books where Witness Protection is a theme or at least an element, with lives lived with a new identity and people harbouring secrets. She's a really good writer, Col, and this particular book is probably more your scene than some of her others. And yes, the whole idea of witness protection is really fascinating, I agree. I just purchased Murder is Academic as an eBook. Would rather have paper, but probably won't run into here easily. And I will keep an eye out for the others at the book sale. This one actually sounds more like my type of thing than the Cassandra James, I am sure I will read it later. I hope you enjoy the book Tracy. Thinking about it, this one probably is more your style, but I hope you will like all her work. I love libraries, too. I used to always check out a library branch when in a different part of my city. That was as important as finding a cafe in which to have tea/coffee and a treat. I should make an effort to go to libraries more - I used to haunt them when I was younger, but don't use them so much now. I started INVISIBLE while my car was being serviced this morning and couldn't put it down!. I finished it this afternoon and have just recommended to my daughter and my book group. Glad Christine is writing again and look forward to more books! Exactly my thoughts. A really good book, and she deserves a wider audience.